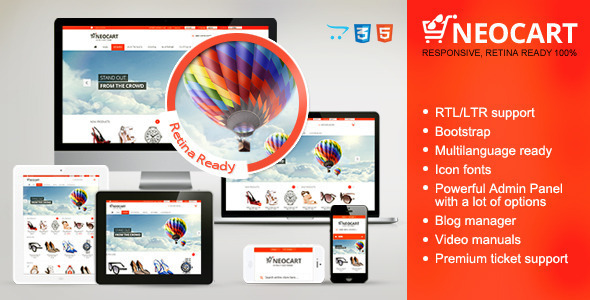 Neocart is new powerful modern opencart theme. Clean design will attract any customer. Easy in use, powerful in customization – don’t spend your time on finding better solution. Don’t hesitate – buy our theme! Real elegant modern theme which will satisfy everyone needs. Unlimited colours, backgrounds, textures, fonts etc. 2 predefined (different structures) layouts. Basic, Dark. Admin panel that will allow you to create different views of your site. choice between cloudzoom (inner or right part), fancybox.